NZ EdTech developer Xorro Solutions has released free access for school educators to its gamification and real-time assessment solution, Xorro-Q. Xorro-Q enables educators in BYOD classrooms and lecture theaters to ensure the active participation of every single student in instant challenges. Challenges can be prepared ahead of time, or better, created in-class around existing resources and activities such as slide shows, videos etc. Using Q is simple, and quick: Students access Q using any browser (no plug ins, no downloads, no apps). Xorro-Q is optimised for use with mobile phones as well as tablets and full sized screens. The Facilitator (teacher, lecturer, trainer or presenter) can ask “instant” questions, or can select and ask pre-prepared questions. Student responses are instantly available without having to disclose the individual contributor. Questions can be automatically scored, and a real-time leaderboard as well as various other interactive values, make using Q a highly motivating yet very safe experience for all. All responses are saved into an on-going gradebook for later access and analysis. 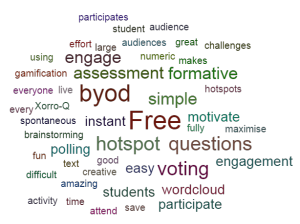 Save time and enable full participation: You’ll be using Q to brainstorm, create live wordclouds, check class conceptual understanding, run class contests and instant quizzes in no time! – and of course, saving time and energy while building that essential formative assessment record. To get started, enrol for a free account. You’ll get a username and password to use Xorro-Q as a Free Facilitator. Login to your Facilitator Home Page; download the Q-Launcher desktop software, or just get started (“Activities tab”) in creating some questions and activities.